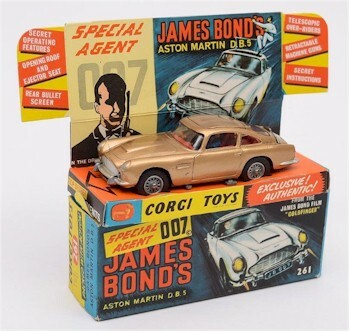 Brian Goodison-Blanks, an expert in collectables, toys with the past as he recalls British toys made in the mid-20th century, recollecting such names as Britain's, Lesney, Corgi and Matchbox. He nostalgically remembers how enthralling they were then in his childhood as they are to him now today. A Corgi James Bond (007) Aston Martin DB5. During the mid-20th century, British toy manufactures were the world leaders in design, concept and production. Names like Britains, Corgi, Dinky, Meccano and Matchbox dominated the market and were the cause of many a schoolboys face pressed up against a toyshop window on every High street. Though the toy industry has embraced the digital age full force, these names are still market leaders in the world of auctions and collectables. Britain's toys developed from the company established by William Britain Jnr after he developed a hollow casting process that revolutionised the toy soldier industry. They quickly became the market leader with companies like Crescent and John Hill following with similar products. The box sets of soldiers remained the same (apart from changes in packaging) for decades, up until the 1960s when the laws governing lead manufacturing changed and the firm switched over to plastic soldiers. A Britain's Model Hunting set in original box. One of Britain's early factories was in set up in 1907 in Sutherland Road in Walthamstow, London and the company remained in the area until 1991. 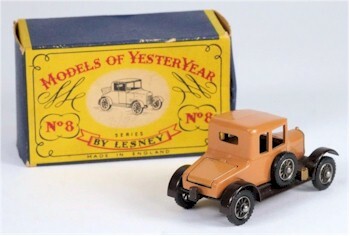 Another great name of the British toy industry, Lesney, also had its roots in North London. In 1947 Leslie Smith and longtime school friend Rodney Smith started working with John 'Jack' Odell from a derelict pub and in 1948 produced the first of their Matchbox 1-75 series. The story goes that John Odell's daughters' school only allowed children to bring in toys that would fit in a matchbox. So, in response to these restrictions Odell designed a scaled down version of the companies steam roller and as the cliché goes, 'the rest was history'. A group of Lesney mint and boxed 1-75 vehicles. During the late 1980s and early 1990s, many of the major companies began to notice the demand for the original toys at auction and collectors fayres. The market soon became flooded with commemorative versions and 'collector's edition' limited edition sets produced in many cases on the original factory molds. Though these sets are now getting on for 30 years old, they have yet to reach anywhere near the original vehicles of the 1950s and 1960s, which still command the greatest prices. A rare Lesney matchbox Bull Nose Morris. Who hasn't ever wanted to have an original James Bond DB5 in its original box with the secret instructions? The nostalgia of having owned or dreaming of owning these toys and drooling over the shop window or the coloured catalogues is a strong incentive to buyers and will probably continue to be so for many years. It is funny how today I have an opportunity to see many of the toys made in the factories I used to pass in my childhood. I can distinctly remember the double decker buses outside the Matchbox factory used to transport the finished toys and the distinctive Britian's logo above the entrance to their offices. Their appeal just as enthralling then as they are today. Toying with the Past was written on Wednesday, 5th August 2015.